There are only so many ripe avocados a household of two people plus two dogs can get through in a few days. Especially given avocados are seemingly toxic to dogs. This is a recent lesson I’ve learnt after winning the ripe avocado lottery. Keen to give something back to the community my husband has been helping at our local farmers market. In return he comes back with armed with free fruit and vegetables. One of the thank you gestures he receives most weeks is tons of perfectly ripe avocados. Literally as many as a cafe would churn through during a busy breakfast service. Until that moment my avocado dilemma was usually debating whether to be patient and wait an extra day to enjoy a perfectly ripe avocado. Now, confronted every week with 20-30 perfectly ripe ones, my dilemma has become how to preserve or use them all quickly. First we take the obvious path and get to work on a big batch of guacamole. Big is an understatement – its usually a giant bowl, enough to feed a small Mexican village. Preserved with lots of lime it lasts for a few days. Next comes the avocado great avocado giveaway. Hopeful it will bring good karma. We have been sharing some of the lottery winnings with fellow avocado lovers – our neighbours, friends, yoga teachers and gym instructors. Even the technician who came to fix our fridge went away with a couple (and a smile on his face). It’s amazing how people respond to free ripe avocados. Finally I’m become an avocado baking goddess, making muffins and more. 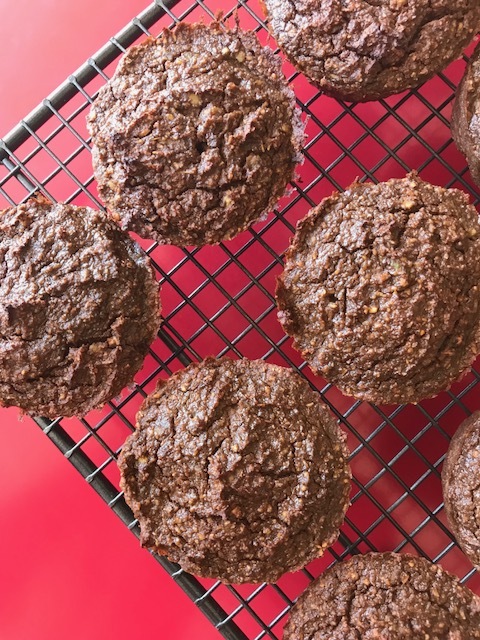 That’s where these healthy avocado muffins come in. They were my first attempt at baking with avocados. I’d usually consider them too precious a commodity to use in a way that disguises their flavour. With little time before the avocados pasted their best I quickly landed on the recipe here. It’s adapted from one by Ashley at Fit Mitten Kitchen. 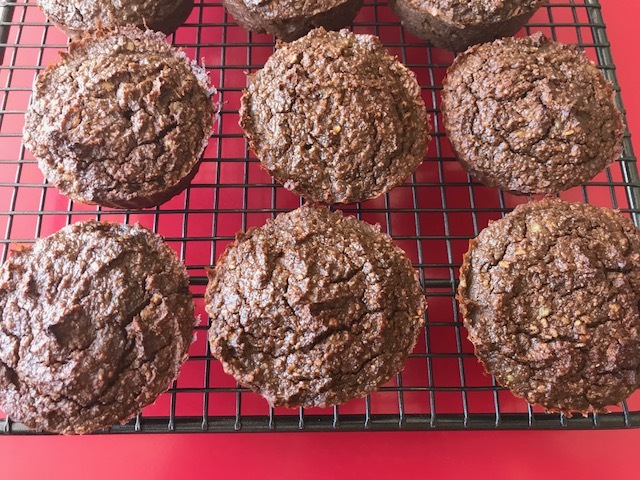 These gluten free muffins combine avocados and cocoa power with (optional) matcha powder , all anti-oxidant rich superfoods. The result is a guilt-free moist muffin. Consider them any time of day snacks. Enjoy them as a on-the-go, as a treat with a coffee or as an afternoon hunger buster. Add to a bowl all of the dry ingredients, using a sieve if you can to avoid any lumps. In another larger bowl add all of the wet ingredients – except the yoghurt (or nut milk). Gradually add the dry mixture into the wet mixture, using a spatula to carefully fold the mixtures together until you have a fluffy even mixture. At the same time gradually add the yoghurt (or milk). Using two spoons add the mixture muffin by muffin into the baking tray, allowing room for them to rise. 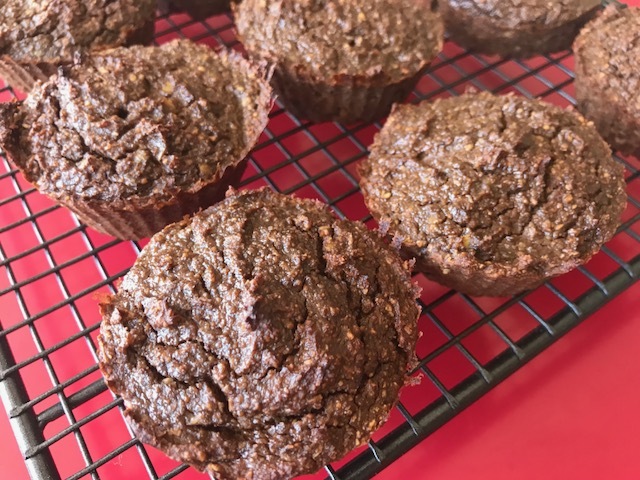 The muffins were a huge success – and its true that the taste of avocado doesn’t come through into the muffin – they definitely play a crucial role adding texture texture. I’d love to here – what would you do after winning a ripe avocado lottery? Tags: avocado, chocolate, gluten free, matcha, muffin. Bookmark the permalink. Thanks Ronit – I’m now baking with avocado most weeks – certainly worth experimenting with if avocados are plentiful! I am yet to use Avocados in bakes. Have just had them in salads. Your post really inspires me to work on it. Loved it. Thanks so much Vidya – this was my first attempt to and I’m convinced they work really well. 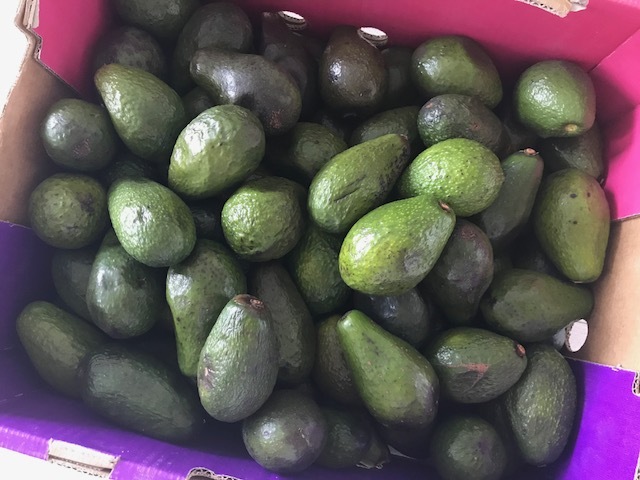 I hope you give it a go…..
Hi Vero – good to hear you’re on the same page as me with avocados being a precious commodity….since winning the avocado lottery as I have called it I am probably eating a whole avocado everyday – thankfully they are super nutritious! I love avocados. If I get extra, I will keep this in mind! Sounds good and yes baking is a great way to make use of excess avocados! Laura, How I wish I was part of that avocado giveaway. We love avocados! This recipe is amazing! I know exactly what you mean by avocados not changing the taste but adding so much to the texture! I have used them in Indian sweets/desserts the same way too. Hi Sandhya – if only I could share some of my avocados with you I would. So glad you have also had success with avocado baking – I’ll keep an eye out for a recipe from you…. What a bounty of avocados! I can’t even tell you how much that would cost here! I would be in heaven!! I once had a labrador that got a bag of avocados off the top of the refrigerator. That’s was like six feet tall. There were a dozen in the bag and he ate them all including the seeds which all came out with no harm. Labs are like garbage dogs. I guess we were pretty lucky.And this was 40 years ago when we didn’t know so much as we do now. Mollie what a story – one of my fur babies will eat anything and everything too so I have to keep a close eye on him when avocados are around! You were lucky indeed….